If you haven’t checked out Fête Accompli for lunch downtown, I suggest you get your act together and head over there as soon as possible. I am so glad that I caught on to this place. Never again will I put up with the crowds and spend the household budget of people in “developing” nations at the Whole Foods salad bar when I am craving vegetables but feeling indecisive in west downtown. This place is a vegetable lovers dream come true. 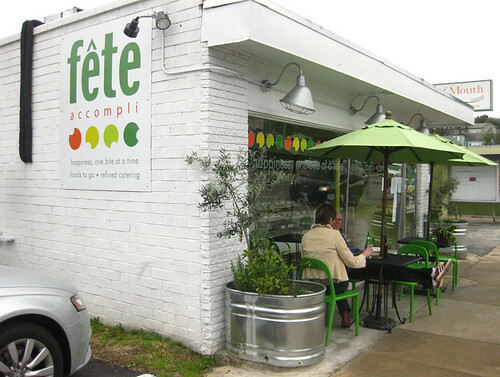 Fête Accompli is right on 12th street one block east of Lamar by the Thundercloud. They really have something for everyone, the owner’s mother is a dietician so she has a lot of knowledge about creating food for people with special dietary needs, not just vegans. But the vegan selection is incredible! The place is pretty tiny and mostly serves portions for take out and they do catering. They also have a couple tables and chairs inside and outside. When you first walk in you are greeted by a large deli case and a menu that has soups and sandwiches and usually a friendly person as well. There is also delicious fresh baked vegan bread. The deli case is filled with different kinds of salads. The first time I went the whole top level had different vegan items to choose from, maybe 7 in all. There are also different dessert items and lots of stuff packaged to go in the coolers on the side. I think this would be a terrific place to stop in and get food for a meeting or to pick up dinner for the evening while you stop for lunch. Everyone who works there is really friendly and they all seem to be knowledgeable about what is and isn’t vegan (although watch out for honey). What I usually do is get the box lunch. For nine dollars you get to choose four items and you get a cookie. It is a lot of food. 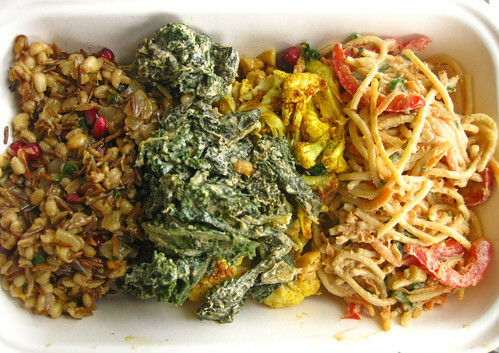 Last Friday I got a cranberry and wild rice salad, a freaking delicious Kale tahini salad, some roasted cauliflower that was some of the best cauliflower I can remember and a creamy noodle salad. Everything had so much flavor and texture that I was kind of overwhelmed. These people know there vegetables. I can’t even really compare it to other salad bars because the flavors are just on another level. The best part, if you are vegan, they will give you a chocolate peanut butter truffle since the cookie in the special has animal products. There aren’t many places that would give you an extra because of your restriction and that is why Fête Accompli has become one of my favorite lunch destinations in town. 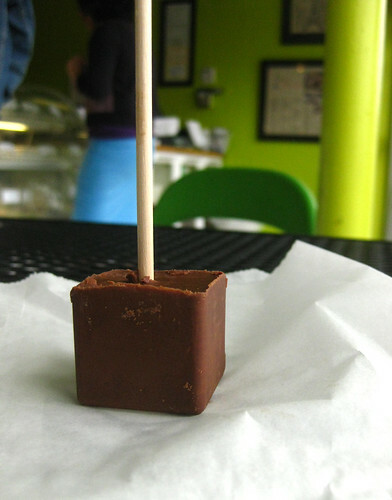 I mean chocolate + peanut butter = happiness for me even when it is only so-so. These truffles at Fête make me feel transcendent for hours after eating them. What can I say, I love food and Fête Accompli does it exactly right for me. This entry was posted in Austin and tagged austin vegan restaurant, catering, downtown austin vegan lunch, Fête Accompli, lunch, salad, take-out on February 22, 2010 by lazysmurf.